The big announcements continue at Pirtek Dial Park. In more recruiting news, this of course being somewhat a very important role, we are thrilled to announce that the lovely Holly Stubbs will take on the position as ambassador for the Football Club during season 2019. Holly’s father Craig is a former player and her late grand father Garry Stubbs is a Life Member & Legend of the Football Club. 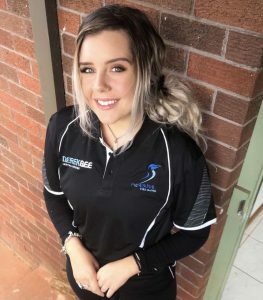 Holly has previously helped out in the canteen on numerous occasions and has been spotted running laps of Pirtek Park in the early hours of the mornings – she will be a great promoter for the club. Holly is more than excited to get things underway as she has some fantastic ideas that she will bring forward as she will promote and raise funds for the Penguin Football Club along with encouraging and welcoming families, community members and members to the Football Club. Welcome aboard Holly, we appreciate it! We would also like to thank outgoing Ambassador Nicole Targett for her fantastic contribution over the past twelve months.